A statue of Our Lady of Fatima stands in the Igreja de São Domingos, Lisbon, Portugal. During this year in which we celebrate the 100th anniversary of the apparitions of Our Lady of Fatima, as promised I would like to reflect with all of you on the message that Our Lady left us. St. John Paul II stated that her message is even more relevant and urgent today than when it was first given. 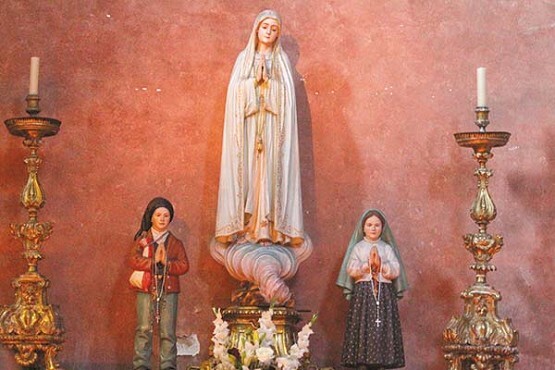 Before diving into the essential message that our Blessed Mother gave to the children of Fatima (Lucia, Blessed Jacinta and Blessed Francisco), it is important to recall that these apparitions officially have been approved by the Church. This means that the Church has recognized the authenticity of the revelations, i.e., that Our Lady truly did appear to these children. Although these are considered “private revelations,” and therefore Catholics are not bound as a matter of faith to accept them, it would seem foolish to ignore or dismiss them, since they are genuine. The heart of the messages that Our Lady of Fatima gave to the children, and therefore to all of us, were given over a period of six months, from May of 1917 to October of that same year. They are summarized here, but for more detail, you are invited to visit the official website of the World Apostolate of Fatima (wafusa.org). First, in addressing the eternal order, Our Lady told the children that hell exists and that souls are being lost to it because there is no one to make reparation for their sins. It seems that we don’t like to hear about the reality of hell, but this is a solemn teaching of our faith that all of us are bound to accept. Mortal sin is what lands a person in this place of unspeakable sadness and eternal separation from our loving and most merciful God. And Our Lady revealed that there are souls being lost because of a failure to repent and make reparation for sins committed. We must make reparation for our sins, but we can also make reparation for the sins of others. This is part of what it means to be a member of the communion of saints, which we profess in the Apostle’s Creed. We must pray (especially the rosary) and make sacrifices for our own sins and the sins of the world. This we do, of course, in union with the merits of Jesus Christ, which were gained at the great price of his own blood, shed on the cross for our salvation. We also do this in union with the merits of the saints, which they achieved through their own sanctity and union with Christ’s paschal mystery. Nothing can be achieved by our own merits alone, separated from the saving redemption of Christ’s death and resurrection. Secondly, speaking of the temporal order, Our Lady revealed to us that war is a consequence of sin. This is true not only of World War I, but all of the wars which have followed and which continue to plague our world even today. Can anyone deny the reality of the horror of the wars that continue throughout recent history? If we wonder why, with all the human progress that mankind has made, we still experience war and violence, we need look no further than our own sins and the sins of the world. Third, Our Lady taught us that the salvation of souls and the attainment of world peace require the conversion of sinners. She said to the children in her message of October 1917, “People must stop offending God because He is already so much offended.” This conversion must begin with each one of us. Lent is a time of repentance and conversion. We are all sinners, and I include myself squarely in that group. We must take the call to conversion seriously and not gloss over this important aspect of the Christian life. We can no longer make excuses for ourselves, or be lulled into a lukewarmness that says it really doesn’t matter. A famous spiritual writer once said that “lukewarmness” is the Devil in disguise. If we need further convincing, we need only look again to our Blessed Lord’s words at the beginning of his public ministry: “Repent, for the kingdom of heaven is at hand!” Jesus spent much of his public ministry calling people to conversion. A careful reading of the Gospels will bear this out. So, the message of Our Lady of Fatima is really a restatement of the Gospel for our troubled times. As a loving mother, she wants all her children to enter heaven. This should be our ultimate goal. God is so merciful with us sinners. He stands ready to forgive and receive our repentance and firm resolve to lead a better life. During this Lent, let us all approach the throne of Divine Mercy in the sacrament of penance and reconciliation. And let’s keep praying (or begin praying?) Our Lady’s rosary. God bless you!